More trouble for Barnes & Noble? Photo courtesy of NYT article linked below. I can't take credit for this find, the link came from the Passive Voice blog. For some of you this isn't news, but I wanted to look at it more closely because it dovetails nicely with my last post on the future of the industry. This article from the New York Times begins by analyzing a B&N company memo from this month. They quote the memo, saying that Barnes & Noble's losses for e-books and Nook e-readers "will be greater than the year before and that the unit’s revenue for all of fiscal 2013 would be far below projections it gave of $3 billion." According to the article, this includes holiday sales, which in the bookselling business should have accounted for a large portion of annual profits. The article quotes an unidentified insider as stating essentially that B&N will be pulling back from e-book hardware and will seek to license "content" to other tablet makers. To me, this just sounds insane. What kind of licensing does B&N have anyway? It's the publishers who own the books. Barnes & Noble was and is a distributor. They're in the business of delivering product to end consumers. They're a middle-man. Developing the Nook was a smart way to hold onto that position and subsidize losses they were taking in physical stores. To me it sounds like they're more or less walking away from that prospect. 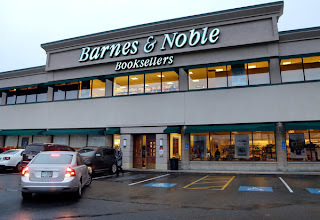 One should also bear in mind that not too long ago, B&N spun the Nook into a separate division in order to protect the main business from investment expenses (and losses). In my opinion, this was a clear case of watching the bottom line for the quarter without giving a moment's thought to the future. In their defense, the Nook has had stiff competition. B&N came late to the e-book game and when they finally entered, they were miles behind the competition. The Nook was a good start, and it gave them a jump. It also helped that they used technologies that were end-user friendly, making it possible for some readers to"hack" the devices to expand their usefulness. That's something Amazon doesn't and probably will never do. And many Nook users really seemed to like the devices. After all, they came out with the "glowing screen" technology first, and they were first to make their e-reader function more like a tablet. But now, after dumping millions of dollars into the Nook and laying the groundwork for what may have replaced much of their lost income from physical stores, they're changing their minds? They're going to license content? Again, how does that work? Why would a manufacturer like Sony or Apple license content from B&N when they could bypass the middleman and license directly from the publisher? What exactly do they hope to sell, and how will they force third parties to license this content? Again, this looks to me like an attempt to shore up this quarter's bottom line without a second thought to what happens next year, or ten years down the road. This way of thinking is outmoded, a fact that has been proven by Amazon again and again. These executives seem to be terrified of the stockholders, and yet they're doing the worst thing possible for the company in the long run. This is the kind of behavior that leads to a business going away forever. That's disappointing, because I'll miss browsing the nice big two-story B&N we have downtown. I doubt we'll ever see another bookstore that big in this area (or most places). I understand that Barnes & Noble has been stuck between a rock and a hard place. They had to downsize in order to remain profitable. That was inevitable. I would have liked to have seen this stabilize at some point without the company going belly up. In light of the latest reports I've seen, I doubt that will happen. Sadly, I don't think Barnes & Noble will be with us two years from now. To be honest, I'll be a little surprised if most of the stores aren't gone by the end of the year. 2010-2012 were times of cataclysmic change in the publishing business. It was 2010 when self-publishing really came into its own and previously "untouchable" authors began selling tens of thousands (millions, in some cases) of books. Amazon, being masters of marketing and digital commerce, knew how to strike while the iron was hot. They used their power position to draw established authors into the Indie fold with promises of easy sales and higher percentages of profits. In many cases they delivered, and then some. And they pushed the Kindle by taking losses and offering savvy shoppers deals that were -and still are- just too good to pass up. With the fire kindled (excuse the pun) tens of thousands of authors jumped in with both feet. For the most part, those with no previous publishing experience got the first payoff. Their counterparts were either trapped in contracts with no-compete clauses or simply too afraid to risk everything on a venture that, until now, had always been considered a clear sign of failure. I already mentioned Hocking's nice publishing deal and there was also that three-week period in which Konrath made about $100,000. But those are just the big stories. Even as we speak, thousands of writers who never had a chance of working in traditional publishing are now making a living doing what they (we) love. Others are getting rich and/or signing fantastic deals with traditional publishing houses (like Hugh Howey). Even those who aren't huge commercial successes are practically guaranteed to make coffee money. Like wildfire, the word has been spreading: "There's money to be made in publishing !" Wow. Whoda thunk? But times were not so good for legacy publishers and big book sellers. Borders is gone now, along with a few others whose names I can't even remember. Barnes & Noble is hanging on, but only by rapidly downsizing and cutting costs in the attempt to balance profitability with size. The Nook is helping, but arguably so. The latest analysis I've read suggests e-book sales aren't growing fast enough on the Nook. And big publishers are in much the same situation. Downsizing and consolidation are the catch-phrases in the business right now. Profitability, not so much. Again, shoring up the bottom line by cutting staff, reducing inventory, and closing stores is not a sustainable business model. So, what do I think 2013 will bring? I don't have a crystal ball, but my thinking cap tells me more of the same, mostly. More indie authors taking the plunge, some of them making it big, most realizing this really isn't their thing even if it is nice to have coffee money coming in regularly; the midlist growing to accommodate more authors whose slice of the pie might replace their day job but is less and less likely to make them rich. Big publishers will continue to consolidate and downsize. Barnes & Noble will continue to shrink. Small independent bookstores will see a resurgence, filling in the vacuum created by the demise of the behemoth that drove them away in the first place. Last but not least: Amazon and other commercial sites have taken acute interest in the sock-puppetry and gamesmanship by certain writers. Independent sites like Goodreads have been slower to take up the cause and seem reluctant to out these players, but I believe that in the interest of maintaining loyal readership, they will make a greater effort to stifle this behavior (some have already implied as much). Even if they don't, I doubt it will make much difference in the long run. The authors engaging in this behavior don't have the chops to stay in the business. They already know this; hence the gamesmanship. In my opinion, we'll see the majority of these "writers" disappear over the next few years for one reason or the other. Some of them will be sued. Did you catch that last point? Here's the thing: Misrepresenting your work, the work of others, and so on, is fraudulent. It costs people money and in some cases, makes them feel very foolish. If you think I'm exaggerating, ask Lance Armstrong. After admitting he lied about just about everything and made massive amounts of money doing so, he's being sued for millions. Lance's gain was someone else's loss: the sponsors, the endorsements, even the publishers and the lowly readers who bought his books have all been defrauded. And the lawsuits are piling on. Expect this to continue in 2013, and to spread into other areas. Expect at least one not-so-clever writer to be sued because of this sort of thing. Or not. I'm just making educated guesses here, and for all I know a comet could hit us next week, wiping out half of the civilized world. Barring something like that, I think I have a few good guesses here. We'll find out soon enough.